E. Lucie-Smith, Elisabeth Frink Sculpture since 1984 and Drawings, London, 1994, p. 183, no. SC8, another cast illustrated. 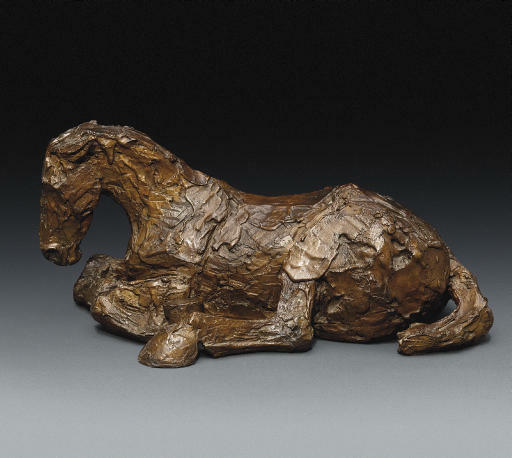 Discussing her use of animals, and particularly the horse, in her work, the artist commented, 'I always try to explain that I haven't done a great many animals - that I'm not in fact an animal sculptor. If you love animals you have to have some sort of sympathy with the way they are or exist, and how we treat them. If I'm sculpting animals I don't want to oversentimentalise them because one can be very sentimental about that part of our life. I'd find it a very sad life without animals: we need them, that's the awful thing ... This is another reason why I'm not a true animal sculptor. The animals I make are far more what I feel about them than what they are in real life ... I'm much more interested in the spirit of the animal. I get into the inside of the animal, and the outside takes care of itself' (E. Lucie-Smith and E. Frink, Frink a Portrait, London, 1994, pp. 121-23).